Topcon ‘Measuring Station’ Opens New Era in Ultra-Precision 3D Measurement. Featuring a wide array of innovative technologies, MS05AX and MS1AX offer superior performance in angle and distance measurement as well as reliable robotic functionality. 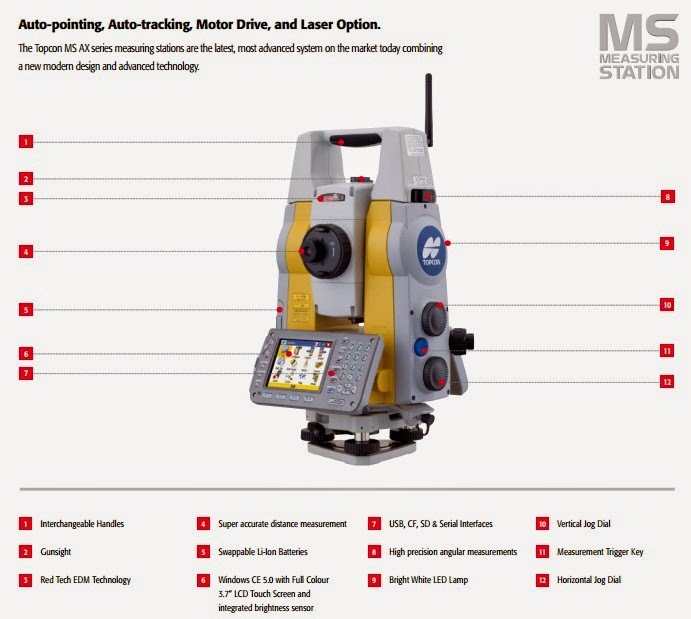 The ‘Measuring Station’ ensures dramatic enhancement in precision and productivity in all applications such as surveying, engineering, construction, monitoring and 3D industrial measurement. The MS05AX employs innovative Independent Angle Calibration System (IACS) technology for unparalleled measurement reliability. Combined with marketproven absolute encoders that incorporate advanced coding and digital-processing technologies, the MS05AX provides the industry’s highest 0.5” (0.15 mgon) angle measurement precision. Cutting-edge distance measurement technology ensures unparalled comprehensive performance. Using reflective sheet targets, the MS05AX provides sub-millimetre accuracy in a range of up to 200 m. With its 3.5 km long-range capability and fast measurement speed, the MS05AX also satisfies every requirement for the reference EDM that is employed for precise baseline calibration. – Sub-millimetre 0.5 mm + 1 ppm accuracy using reflective sheets within the range of 200 m.
– Measures prisms with 0.8 mm + 1 ppm precision up to 3,500 m.
– Reflectorless measurement can be performed with 1 mm + 1 ppm up to 100 m in range. The new MS Series combines advanced technology and modern design innovations. The MS1AX is primarily designed for precise construction applications providing 1” (0.3 mgon) angle accuracy and 1 mm + 1 ppm distance measurement precision. – A 400 m reflectorless measurement capability gives MS1AX further versatility for applications where reflectors cannot be placed. – Measures up to 300 m with 50 x 50 mm reflective sheet targets. – Long-range capability reduces the need for changing instrument positions, resulting in higher work efficiency. Automated Measurement Capability Expands Applications. Effectively performs displacement and deformation monitoring using the state-of-the-art automated measurement capability. Featuring Matrix Detection technolgy, the MS AX range is able to automatically detect, measure and record all prisms that are to be used within a monitoring object, for instance the face of a dam, or length of railway line. Additionally, Rapid 2D Monitoring is available to dramatically speed up the monitoring process. For use when distance measurements are not necessary on monitoring projects to save time! – Bridges, buildings, dams, mining sites, tunnels, railroads and other large structures, both existing and under construction, can be automatically monitored using remote control techniques. – MS05AX and MS1AX implement an advanced auto-pointing algorithm optimized for monitoring applications. The MS AX automatically sights the prism closest to the telescope center regardless of the distance from the instrument even if multiple prisms or other reflective objects are in the field of view. The MS AX series comes as standard with an incredible 1” auto-pointing accuracy as defined by ISO17123-3. Measures tunnel convergence and deformation more efficiently than ever. – Quickly and accurately measures the convergence of tunnel supports, crowns and walls. Ideal for the sites using NATM. – Rapidly measure tunnel cross-section profiles using the combination of reflectorless EDM and motor drive functionality. The incredible 400 m reflectorless range of MS1AX makes it an ideal solution. – The auto-tracking function of MS05AX/MS1AX allows it to precisely control the position and attitude of a tunnel shield machine. – The optional LSP1 Laser Guide emits a visible laser beam for profile contour projection on tunnel faces. – MS05AX/MS1AX can be employed for automatic or unmanned monitoring of tunnels, either existing or under construction, to ensure safety and save labor. Major Civil engineering tasks demand the highest accurcay and reliability possible. The MS05AX/MS1AX dramatically increases construction efficiency and accuracy with its superior measurement capability in combination with unique target systems. Precise measurements using reflective sheet targets and compact prisms enable high-quality bridge construction with short lead times. – In-process measurement of framework members ensures the accurate manufacture of each part, increasing productivity in on-site assembly. – Automatically monitor displacement and deformation of existing bridges for maintenance and safety purposes. Position, geometry and dimensions of complex members of various plants can be measured with sub-millimeter to millimeter accuracy. – For as-built measurement where real precision is required. – For precise positioning, leveling, vertical and in-line alignment of pipes, machineries, wind power generators and other components. When absolute accuracy is required and no compromise is allowed, the MS05AX provides a flexible solution for the precise measurement of dimensional stability and geometry of important structures. – MS05AX measures points with sub-millimeter accuracy using reflective sheet targets that can be directly applied to the measuring points. – The easy-to-setup mobile system provides maximum convenience in 3D measurement from multiple positions. Fully equipped with advanced features to enhance measurement efficiency. The auto-pointing function using reflective prisms or sheet targets realises automatic measurement for applications such as unmanned deformation monitoring. – 1,000 m Auto-Pointing range using one standard prism. – An advanced Auto-Pointing algorithm ensures reliable measurement to the predetermined prisms in periodic monitoring applications. The MS05AX/MS1AX constantly tracks a moving prism up to 90 km/h at a distance of 100 m, or 18 km/h at 20 m.
– For continuous measurement of moving objects. – For precise position and attitude control of tunnel shield machines. – For high-precision setting-out tasks. – Over 1MB of internal data memory. – CF card Type II, SD card* and USB memory are supported. * CF type adapter required. – A full line of prisms and reflective targets are designed to maximize measurement accuracy and efficiency. – Highest in its class IP64 dust-water resistant withstands dusty or wet conditions. – Weatherproof multi-port maintains IP64 protection even with an RS-232C data cable or an external battery connected. Both the display and full-alphanumeric keyboard on the control panel are adequately illuminated allowing easy operation in tunnels, at night, and in low lighting conditions. – Prisms or sheet target can be located easily in dim lighting conditions using the high-intensity white LED built into the telescope. – Brightness and illumination pattern (blink or on) can be selected according to the environmental conditions. MS05AX/MS1AX withstand the finest dust as well as the hardest driving rain and showers. The industry-leading IP64 protection provides unparalleled reliability in the harshest work site conditions. No matter the circumstances on the job site, MS AX series always work without downtime. – MS05AX/MS1AX incorporate the flexible Windows CE operating system. – A large TFT color LCD display provides an easy to use intuitive graphic interface and touch screen operation. Topcon offers positioning products that deliver unparalleled site-wide performance and integration. Topcon’s history of technological advances and our reputation for superior reliability means there’s no other company positioned to provide you with a better “Total Positioning Solution.” From survey to inspection Topcon, through our dealer network, provides the innovative technology that gives surveyors, civil engineers, contractors, equipment owners, and operators the competitive edge by addressing such critical issues as increasing profits, quality craftsmanship, improving productivity, lowering operating costs, and enhancing job site safety. To ensure that your Topcon instrument maintains peak performance, your local Topcon dealer offers factory trained and certified service technicians. If service isn’t available in your area, our European Service Center offers a repair and return policy second to none.